Applying for a position within the healthcare industry. Here are some FAQs about healthcare resumes. Q. What information should I put in my resume? A. The dictionary defines a resume as a "short account of one's career and qualifications prepared typically by an applicant for a position." 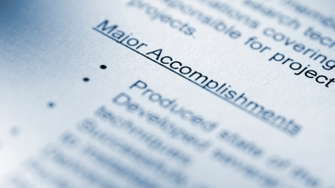 Most specifically, an effective resume is a clearly written, concise document which presents your work experience, skills, accomplishments, education and relevant personal information. Q. How long should my resume be? A. A one page resume would be effective. Any more than two pages and it will be considered a negative. Q. Should letters of recommendation be sent with your resume? A. Yes, one or two outstanding letters of recommendation from the person(s) you reported to at your last position(s) will give the prospective employer some additional incentive to interview you. Be sure to send the references as soon as possible, preferably with your resume. The employer is generally impressed when they see your positive references with your resume--often those references are selected first because excellent references are persuasive. Q. What is best: Make my own resume or have a professional resume service do one for me? A. The resume should reflect who you are and your efforts in content and form. If you can develop your resume on your own with helpful resources and you feel the results are there, then that's wonderful. If you decide to have a professional resume service help with your resume, be sure you work with them closely so that your resume will retain your personal touch and reflect you. Q. What color paper should I use? A. A heavy-weight white bond is best. You and possibly the prospective employers or recruiters may be faxing some resumes and the type is cleaner and sharper on a white background. Q. What is the difference between a chronological and functional resume? Which one is better? A. A chronological resume outlines your work experience by dates. A functional resume outlines your background by broad based areas of responsibility. Depending on your history, one format may highlight your skills better than the other. You may even want to try a blended chronological/functional resume which combines both.